A street lined with restaurants, shops and people watching, four blocks of which have been closed to traffic, Pearl Street is the heart and soul of Boulder — and has been for 40 years! 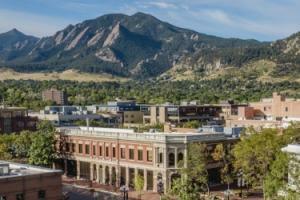 Here, in the center of historic downtown, locals and visitors stroll the brick-paved pedestrian walkway, linger on sun-dappled benches and restaurant patios, shop to their hearts&apos; content, and stop to watch only-in-Boulder street performers. Watch this inspiring PBS video featuring Pearl Street&apos;s street performers or this KUNC spot about Boulder&apos;s buskers. 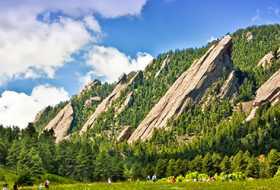 Whether you&apos;re perusing fun trinkets and games at Into the Wind, cooling off in the pop-jet fountain or playing in a rock garden with big boulders, Pearl Street is just the start of what do to in Boulder with kids. Pearl Street is for the type of person who hunts for great finds in even greater shops. Outdoor buffs will find a mecca of active lifestyle retailers and fashionistas will find everything from vintage-store steals to boutique one-of-a-kinds. Not a Shopper? No worries. There are plenty of sunny (or shady) places to sit and wait for your shopper. You won&apos;t be the only one! You&apos;ll see lots of people just hanging out, watching the locals and enjoying the sunshine. 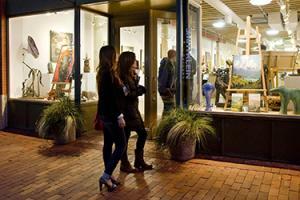 A work of art in its own right, Pearl Street has many galleries, local artisan shops and outdoor works of art to entertain the eye. Bonus: View our virtual Arts and Culture Guide for a walking tour of downtown&apos;s public art on the last page. 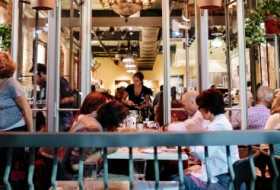 Pearl Street was named by Food & Wine magazine as one of the Ten Best Foodies Streets in America. 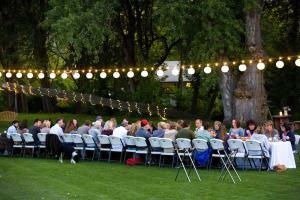 There are almost 120 restaurants to choose from, ranging from James Beard Award winners to innovative up-and-comers. 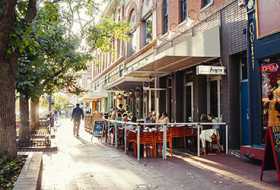 Downtown is home to breweries, pizza joints, delis and Boulder&apos;s best restaurants. If you want to bring some of the foodie goodness back home with you, stop by Savory Spice Shop and pick up the Pearl Street Plank rub, yum! On Wednesdays and Saturdays during harvest time, you&apos;ll also find the Boulder Farmers Market downtown. Pick up pre-made meals, fresh flowers, and just-picked produce or just take in the sights and smells of farm-fresh fare. Boulder&apos;s downtown is packed with history, much of which you can see simply by walking around and reading a series of plaques along Pearl Street. The Downtown Historic District was listed on the National Register of Historic Places in 1980, and you can learn about several historic sites in our Historic Walking Tours Brochure or take a tour with Boulder Walking Tours for 90 minutes of all kinds of information about downtown Boulder. Pearl Street has been called a living stage, and for good reason. On Wednesday nights during the height of the summer the free Bands on the Bricks live music performances light up the 1300 block of Pearl Street. Just up the road, you&apos;ll find the historic Boulder Theater. As Boulder&apos;s largest performance venue, the theater has a photo-worthy marquee and offers great live music, film and comedy performances. As you walk along Pearl Street, you&apos;re sure to stumble upon a great street performance (or five). Everything from high school kids playing violin to solo piano players to bluegrass bands are busking on Pearl Street. And you&apos;ll probably hear live music wafting out of a few coffee shops as you walk along. Pearl Street is a magical place in winter. Musicians and street performers entertain crowds on sunny days, lights twinkle all up and down the street every evening, steamy coffee-shop windows beckon you in for a cup of hot cocoa, and independent retailers mean you could shop all day long. A string of special holiday events kick off in November with the Switch on the Holidays and continue with St. Nick on the Bricks and the Lights of December Parade. 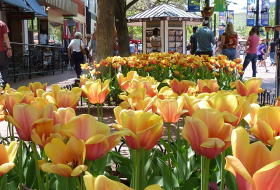 In springtime, the flower beds all along Pearl Street bloom with over 15,000 tulips. It&apos;s tough to predict when the buds will bloom at their peak, but it usually happens around mid to late April — and it is a sight to see! Between, 11th and 15th streets, Pearl Street is closed to traffic. But the fun continues on! The West End is home to a formidable conglomeration of farm-to-table restaurants, boutiques, a chocolate shop, bakery and plenty more to explore. On East Pearl, you&apos;ll find even more shopping, fine and casual dining, and a strip of culinary hot spots that inspired Food & Wine magazine to name Pearl Street one of the 10 best streets for foodies in America! Distinctive Western Victorian architecture is replete on Pearl Street. Often, you can identify the time period of a building on Pearl by looking above its doorway for the year it was built.